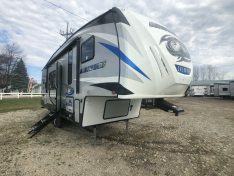 The newest edition to the Forest River Cherokee brand is the all new Arctic Wolf aluminum framed laminated lightweight fifth wheel. 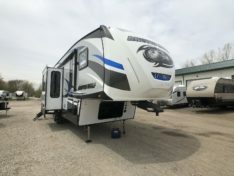 You do not need to sacrifice luxury for this light weight fifth wheel. With standard features like a 24000 lb capacity One Touch Auto Leveling System, Reese Revolution Hitch Pin, 12 Cubic Foot refrigerator, Tire pressure monitoring system, Comfort Climb power lift and recline master bed, heat and massage theater seating, 50 amp service and a plethora of other groundbreaking standard features at a less than expected price. 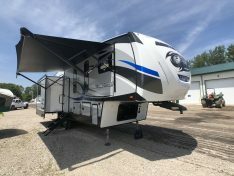 We welcome you to view our selection of Arctic Wolf Fifth Wheels. Don't look any further for the ultimate couple's coach. 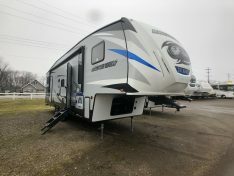 This 2019 Forest River Cherokee Arctic Wolf 285DRL fifth wheel is packed full of amenities that won't disappoint.